An ETF (exchange traded fund) is a collective investment that's built like a mutual fund—investing in potentially hundreds, sometimes thousands, of individual securities—but trades on an exchange throughout the day like a stock. What's the difference between an ETF and a mutual fund? Investors can trade ETFs in real-time throughout the trading day, unlike mutual funds that only trade once a day. ETFs have lower investment minimums. An ETF's minimum is the price of a single share, which could be as little as £50, depending on the ETF. A mutual fund may require £1,000, £3,000, or more to get started. ETFs have more transparent pricing. ETFs provide real-time pricing, so you can see their prices change throughout the trading day. A mutual fund isn't priced until the trading day is over, so you don't know your price until after you've placed your trade. ETFs have more transparent reporting. ETFs reveal their full holdings on a daily basis, unlike mutual funds which often disclose only the top 10 largest constituents. What exposures and strategies are available as ETFs? The first ETFs tracked broad stock indices like the FTSE 100 and S&P 500. Over time, ETFs have developed to offer exposure to all major asset classes (equities, bonds, REITS, currencies, commodities, ESG) as well as sectors, geographic regions, single countries and systematic investment strategies aka “smart beta”. The new generation of ETFs are extending the approach to include emerging investment themes (such as Cloud Technology, Robotics or Future Cars) and even active investment strategies. Who can buy/invest in an ETF? Any investor including institutions and private individuals can invest and trade in ETFs as long as the ETF is registered for sale in their country. How do you invest in an ETF? Financial advisors: provide advice on ETF selection and trade on behalf of clients. Stockbrokers: buy and sell ETFs on stock exchanges on behalf of their clients. For UK investors, London Stock Exchange provides a “Find a Broker” tool. Execution only platforms: online services that allow you to invest in stocks, bonds and ETFs without offering advice. Examples of UK execution only platforms on which you can trade ETFs include: AJ Bell, Charles Stanley, Interactive Investor, IG, Hargreaves Lansdown and SelfTrade. Online investment managers: sometimes called “Robo Advisors” provide ETF model portfolios or discretionary options. What are the advantages and risks of an ETF? Transparency – ETFs disclose their holdings on a daily basis meaning investors know exactly what assets the ETF holds. Liquidity – the ability to trade an ETF in real-time throughout the trading day. Costs – ETFs are typically cheaper to own than a mutual fund with the equivalent exposure. Diversification - ETFs provide investors with the ability to invest in an entire market index which could cover a broad range of asset classes, sectors and geographies. This enables investors to spread their investment and reduce risk compared with investing in single stocks. Capital risk – like all investment products, the value of an ETF can go down as well as up. Tracking difference - Even after charges are taken into account, ETFs may not track an index perfectly. The difference between fund return and index return is called ‘tracking difference”. There may be other risks that are specific to the exposure of an ETF – for example Frontier market risk, sector risk, credit risk or currency risk. These will be made clear in the Key Investor Information Document (KIID) that is published on every ETF issuer website. How can I use ETFs? Asset Allocation: Asset allocation can be difficult for individual investors to manage given the costs and assets required to achieve proper levels of diversification. ETFs provide investors with exposure to broad segments of the equity, fixed income, commodity, currency and REIT markets and cover a range of thematic, style and size spectrums, enabling investors to build customized investment portfolios in-line with their financial needs, risk tolerance, and preferences. Both institutional and individual investors use ETFs to conveniently, efficiently, and cost effectively allocate their assets. Trading Tool: The intra-day trading offered by ETFs enables ETF users to gain short-term exposure to a wide variety of markets. Historically, investors have relied heavily on derivatives to achieve short-term exposure. However, for many investors, derivatives are not always a practical solution. The large denomination of most derivative contracts can create headwinds for investors, both institutional and private, from using them to gain market exposure. In this case and in those where derivative use may be restricted, ETFs are a practical alternative. Cash Equitisation: Investors typically seek exposure to equity markets, but often need time to make research and decide on their investments. ETFs provide a “parking place" for cash that is designated for equity investment. Because ETFs are liquid, investors can participate in a market while deciding where to invest the funds for the longer-term, avoiding potential opportunity costs. Hedging Risks: ETFs are an excellent hedging vehicle because they can be borrowed and sold short. The smaller denominations in which ETFs trade relative to most derivative contracts provides a more accurate risk exposure match, particularly for small investment portfolios. What is an index ETF? The most common type of ETF, providing market capitalization weighted exposure to a stock or bond index like the FTSE 100, CAC 40 or S&P 500. Most stock indices, and the ETFs which track them, weight their constituents according to market capitalization. Smart beta indices and ETFs use a variety of different methodologies to weight the constituents and alter the risk/return profile of the basket. Examples include Equal Weighting, Fundamental Weighting, Volatility Weighting and Factor Weighting. Thematic investing follows certain social, economic, corporate, demographic, or other themes that are popular in society, providing exposure to a theme or idea that falls outside of traditional industry classifications like Oil & Gas or Healthcare. Examples of investment themes that are accessible via ETFs include Cloud Computing, Ecommerce, Robotics, BlockChain and Renewable Energy. While most ETFs provide exposure to a rules-based index, Active ETFs provide exposure to the discretionary strategy of an asset manager. An ETC is traded on a stock exchange, like a stock, but tracks the price of a single commodity or currency (or a commodity or currency index). This allows investors to gain exposure to commodity markets without buying futures contracts or the physical commodity. ETCs have a share price that moves up and down as the price of the underlying assets fluctuate in value. ETNs are debt notes issued (normally) by a bank. When you buy an ETN, the bank promises to pay you a certain pattern of return. If you buy an ETN linked to the price of gold, for instance, the value of that ETN in line with the gold price. As an ETN is guaranteed by a bank or other financial institution, the investor is also exposed to the counterparty credit risk of that institution. What is physical replication and what is synthetic replication? Replication is the means by which the ETF delivers the exposure that it promises. Physical replication is the most straightforward – the ETF portfolio manager will own the underlying stocks or bonds that comprise the index exposure. In some cases, the index construction makes it hard or expensive to buy all of the underlying securities and an ETF may need to be synthetically replicated. Instead of owning the underlying securities, the index performance will be delivered by a swap provided by an investment bank. What happens if an ETF shuts down? Typically, the ETF provider will make an announcement about the dates the ETF will stop trading and when the fund’s assets will be liquidated. The notice is usually about 30 days, giving investors time to find replacement investments or ETFs and to alter their trading strategy. Once the ETF closes then it will take some time for the ETF to go through the liquidation process. If you are the owner on record at the time of the ETF delisting, you will get the cash equivalent value of the fund’s assets at the time of sale (liquidation), not the value of the final closing price on the last day of trading. There will be a few days lag between the closing bell and the actual execution of the fund’s liquidation. So there could be slight discrepancies in those prices, as well as some risk. So, your final cash values could be different than the closing trading price as they are truly based on the liquidation price. In other words, the prices of the securities in your fund could increase or decrease during the time period between the last trade and the final liquidation date. So definitely consult with your broker or about the values once the process is complete. Are there any tax advantages to owning an ETF? Tax treatment depends on the individual circumstances of each client and may be subject to change in the future. Similar to conventional index mutual funds, most ETFs try to track an index, such as the S&P 500. An index ETF only buys and sells stocks when its benchmark index does. Big changes to the portfolio - like when a company is added or removed from the index happen according to the index rules at regular ‘rebalances’ during the year. ETF managers can use capital losses to offset capital gains within the fund, reducing, or even eliminating the taxable capital gains that get passed on to fund shareholders at the end of each year. Do HANetf ETFs have UK tax reporting status? German and Italian equivalents? All HANetf ETFs have UK tax reporting status. At time of writing (March, 2019) HANetf has applied for equivalent status in Germany and Italy. Do ETFs have capital gains and dividend distributions? If so, can I reinvest them? Just like mutual funds, ETFs distribute capital gains (usually in December each year) and dividends (monthly or quarterly, depending on the ETF). Even though capital gains for index ETFs are rare, you may face capital gains taxes even if you haven't sold any shares. Is UK Stamp Duty charged on ETF trades? Stamp duty on UK-domiciled ETFs was abolished in April 2014. On most UK share purchases there is a transaction fee called Stamp Duty charged at 0.5%. However, stamp duty is not payable on overseas domiciled ETFs that trade in London. ETFs from the main providers are all domiciled in Ireland, Luxembourg or France. Most ETFs can be held in SIPPS and ISAs, just like a normal share or mutual fund. What types of ETF trades can I place? Limit orders, which ensure that you get a price in the range you set—the maximum you're willing to pay or the minimum you're willing to accept. Market orders, which are likely to execute immediately at the best available price, but you have less control over the price you pay or receive. Stop orders, which combine multiple steps: First, you set a trigger price. When the price of the ETF moves past your trigger price, a market order is immediately created. Stop-limit orders, which also combine multiple steps: Like a stop order, you first set a trigger price. But when the price of the ETF moves past your trigger price, a limit order is immediately created. MOC - ETF is executed at the closing price of the on-exchange ETF listing. NAV - ETF is executed relative to the Net Asset Value of the ETF (normally based off the closing level of the underlying asset). VWAP / TWAP / Over the Day - The ETF execution is spread out over the day or over a period, and is executed in smaller incremental child orders. Pair Trade / Relative - ETF is executed relative to a dynamic (or moving) benchmark (either another ETF, a future, or a live index). Yes, ETFs can be sold short. Yes, ETFs can be included in securities lending programmes. Yes, the normal minimum amount of an ETF an investor can buy is 1 Share. The price of a single share will vary from ETF to ETF. Some trading platforms offer ‘fractional share dealing’ for ETFs enabling investors to buy in even smaller amounts. What is the difference between net asset value and price? An exchange-traded fund's market price is the price at which shares in the ETF can be bought or sold on the exchanges during trading hours, while the net asset value (NAV) represents the value of each share’s portion of the fund’s underlying assets and cash at the end of the trading day. The NAV is determined by adding up the value of all assets in the fund, including assets and cash, subtracting any liabilities, and then dividing that value by the number of outstanding shares in the ETF. It’s basically an indication of the fair value of a single share of the fund. The NAV is used to compare the performance of different funds, as well as for accounting purposes. What is an iNAV and how is it used? Mutual funds only offer NAV at the end of the trading day. As ETFs trade in real-time throughout the day, an end of day price would be too infrequent. The intraday net asset value (“iNAV”) is a method of establishing a point of reference from which investors can value their intraday trading opportunities. iNAV provides an intraday indicative value of an ETF based on the market values of its underlying constituents. The value is calculated by the listing exchange and then disseminated to the public every 15 seconds. How expensive it is to trade an ETF? What is TER and TCO? Total Expense Ratio (TER) is the estimated annual cost of owning an ETF. TER includes the ETF’s annual management charge plus other expenses including index licensing fees, legal fees, administration, marketing, regulation and auditing. TER is quoted on factsheets and KIIDS. If an ETF has a TER of 15bps / 0.15% then an investor will pay £1.50 in annual fees for every £1,000 invested. However, TER does not capture the full cost that an investor will bear when owning an ETF as there will also be dealing costs, broker spreads and taxes to consider. These costs will vary for investor to investor. When combined with TER these additional external costs represent Total Cost of Ownership (TCO). Am I exposed to currency risk when I trade an ETF? If an ETF contains securities which trade in a currency that is different to the investor’s base currency, then the investor may be exposed to currency risk. For example, if a UK investor purchases an ETF which U.S. listed securities, then the changes in the value of the US$ relative to £GBP will impact the performance of the fund, as well as the change in value of the securities. The more volatile the currency, the larger the potential impact on portfolio returns when measured in the base currency. Can currency risk be hedged using an ETF? Some ETFs embed a currency hedge into their methodology to help reduce the impact of currency volatility on ETF returns. This feature will be made clear in the KIID. ETF liquidity is a clumsy term. It is often used colloquially to describe on-exchange traded volumes. The ‘true’ liquidity of an ETF is liquidity that is drawn from the underlying market/asset being tracked, not trading volumes. Given most of the underlying assets tracked by ETFs are highly liquid, most ETFs can draw tens to hundreds of USD millions without having a negative impact on the underlying assets liquidity. This is ultimately the same whether an ETF has a small amount of investment in it (AUM) or it doesn’t have significant daily trading volumes. To understand more about ETF liquidity, listen to our webinar or read our paper. How do ETFs connect to the underlying market? 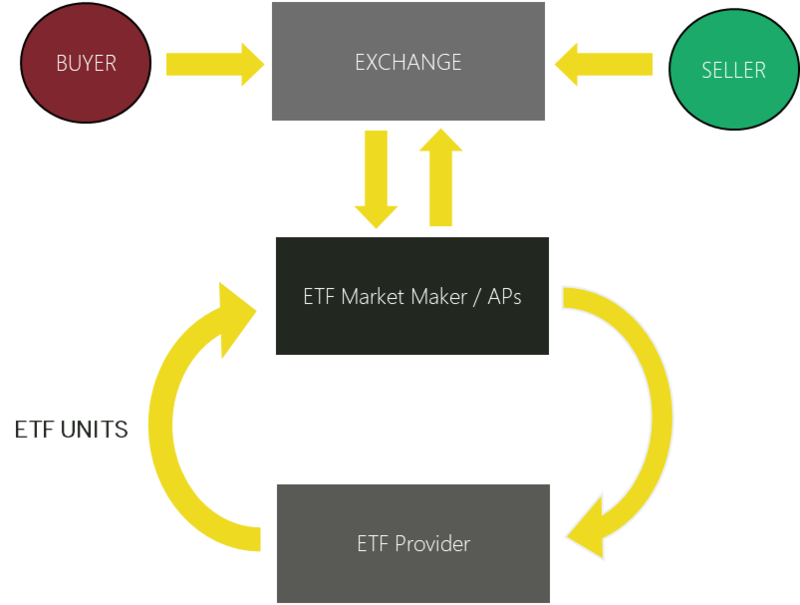 The direct connection between an ETF and the underlying market is facilitated by a service provider known as an Authorised Participant (AP). APs are typically large financial institutions such as investment banks or specialist trading firms. As shown in the illustration below, the AP will buy the underlying constituents held by the ETF in order to create new ETF units (e.g. in the case of a FTSE 100 ETF, the AP will go and buy shares of all 100 constituent companies in proportion to their weight in the index). Who can I speak to for trading advice? Before buying an ETF, investors should get investment and tax advice from a professional advisor. If an investor has questions about trading an ETF, they can contact the Capital Markets desk at the ETF issuer who will be able to help investors efficiently execute their ETF trades. At HANetf, our staff have over 25 years of ETF execution experience and are very happy to consult end investors on efficient execution. We can also help advise on times of day to trade (if relevant) and also advise on the most qualified APs and MMs for each ETF and asset class. HANetf is an independent ETF specialist working with third-party asset managers to bring differentiated, modern and innovative ETF exposures to European investors. Founded by two of Europe’s leading ETF entrepreneurs, Hector McNeil and Nik Bienkowski, HANetf provides a complete operational, regulatory, distribution and marketing solution for asset managers who want to successfully launch and manage UCITS ETFs. HANetf is an appointed representative of Mirabella Advisers, LLP, which is authorised and regulated by the Financial Conduct authority (FCA). HANetf ICAV is an open-ended Irish collective asset management vehicle (registered number C178625) which is constituted as an umbrella fund with segregated liability between sub-funds and with variable capital and is authorised by the Central Bank pursuant to the UCITS Regulations. HANetf Management Limited (registered number 621172) is authorised and regulated as an UCITS management company by the Central Bank under the UCITS Regulations. HANetf majority shareholders are co-CEOs, Hector McNeil and Nik Bienkowski. Other shareholders include employees and external investors with long-term experience in ETFs, trading and asset management- P72 Ventures (founded by Steve Cohen), Elkstone Partners, Jim Wiandt (Founder of ETF.com), Roger Hodenius (co-Founder of FlowTraders) and Blake Grossman (ex-CEO of Barclays Global Investors). What is a white-label ETF provider? A white-label ETF provider provides an operational, regulatory and product management infrastructure to third-party asset managers who want to launch an ETF. White-label ETF providers originated in the U.S. but typically provided only the basic infrastructure needed to launch and operate an ETF. In contrast, HANetf has extended this model to provide ongoing distribution, sales and marketing support as part of a fully integrated offering. GinsGlobal Investment Management is a multi-billion-dollar asset management company, founded in 2000 with operations in North America, Africa, Middle East and Asia-Pacific. Through the HANetf platform GinsGlobal has launched 2 UCITS ETFs: HAN-GINS Cloud Technologies UCITS ETF (SKYY) and HAN-GINS Innovative Technologies UCITS ETF (ITEK). EMQQ is an index created and overseen by Big Tree Capital, a US-based emerging market investment specialist and provider of NYSE-listed EMQQ ETF. Through the HANetf platform Big Tree Capital launched the UCITS version of their ETF: EMQQ Emerging Market Internet and Ecommerce UCITS ETF (EMQQ). KMEFIC is a leading asset management and financial services company in the Middle East. KMEFIC was incorporated in January 1984 by The Bank of Kuwait and the Middle East (currently Ahli United Bank) and The Public Institution for Social Security-Kuwait, as equal shareholders. KMEFIC was listed on the Kuwait Stock Exchange in July 1997.